On Sunday, we had several friends over who had made the transition from Linguistics to Speech Pathology (there have been 5, including me) to help talk to another friend considering it, and just to catch up. One of them, Anna, brought her baby Gianna, who was due the same day as Emmie! Gianna ended up being in a little more of a hurry than slow-poke Emmie and was born about 2 weeks before Emmie. The girls being held by not-their-moms. 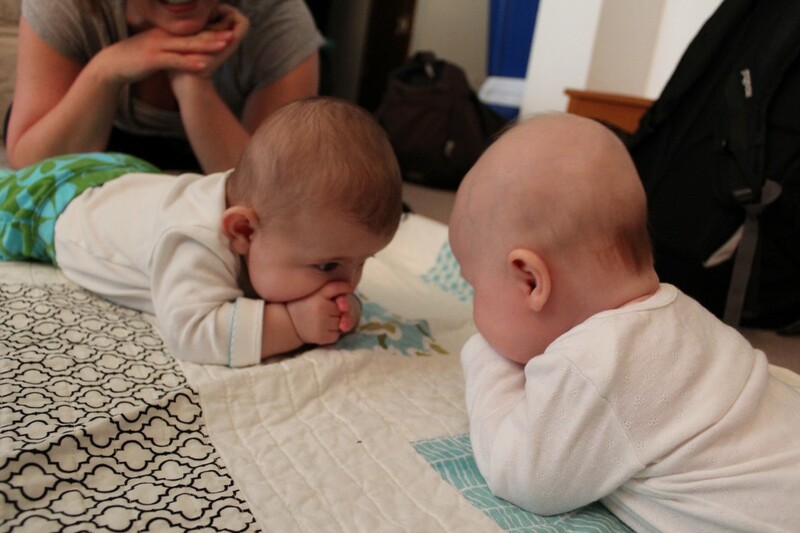 The girls also did some tummy time slash plotting to take over the world with their cuteness. Please note Emmie’s rocking mullet. She was born with that awesome hairdo, thankyouverymuch. Gianna was super into trying to catch and eat Emmie’s hand. Emmie was into staring into space and smiling at grown-ups. 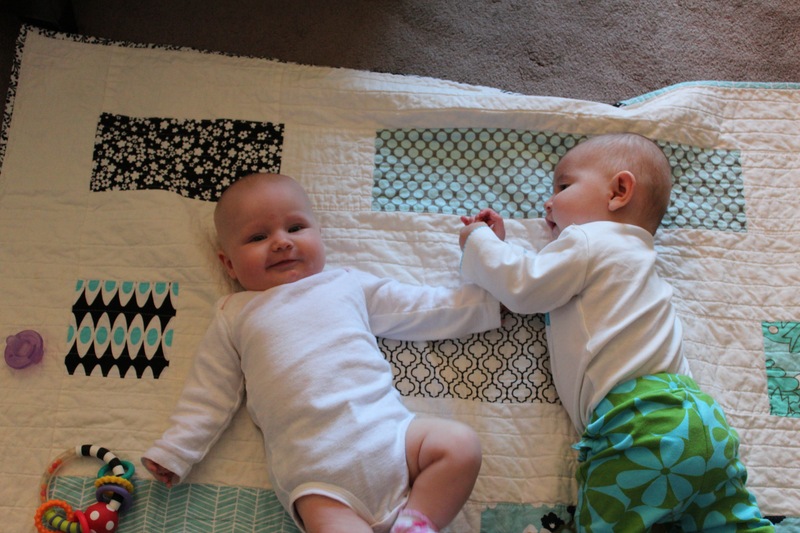 Although they aren’t exactly *interacting* as of yet, they were WAY more aware of each other than their last play date at about 6-8 weeks old (when they both just sort of took turns sleeping and crying). 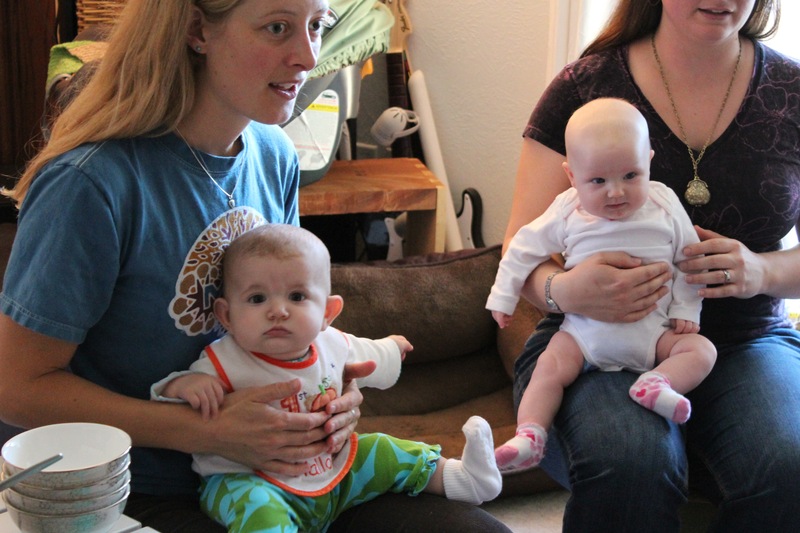 As is probably typical when someone (especially a first-time mom) gets around another baby their baby’s age, I committed the ultimate sin and compared babies. And I paid for it, because I started worrying about how much less aware of toys Emmie was when I saw Gianna batting, grabbing and eating her toys. Emmie CAN do those things, but she usually doesn’t. She’d rather watch everything going on around her, and prefers people to toys. 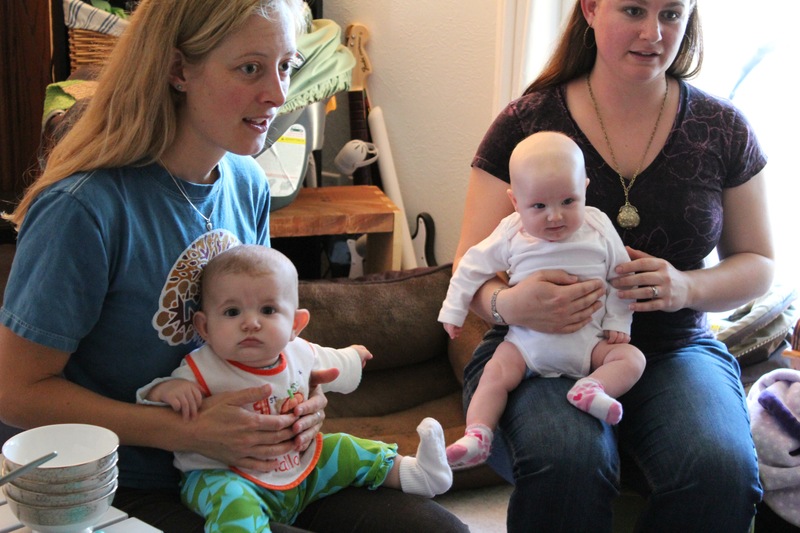 But then Anna commented about Emmie’s head control and neck strength, which was a nice reminder to me that every baby is different and every baby has different strengths. But it was fun seeing Gianna play with her toys because it reminded me that Emmie would be there soon enough! Then today we had even more friend-fun! 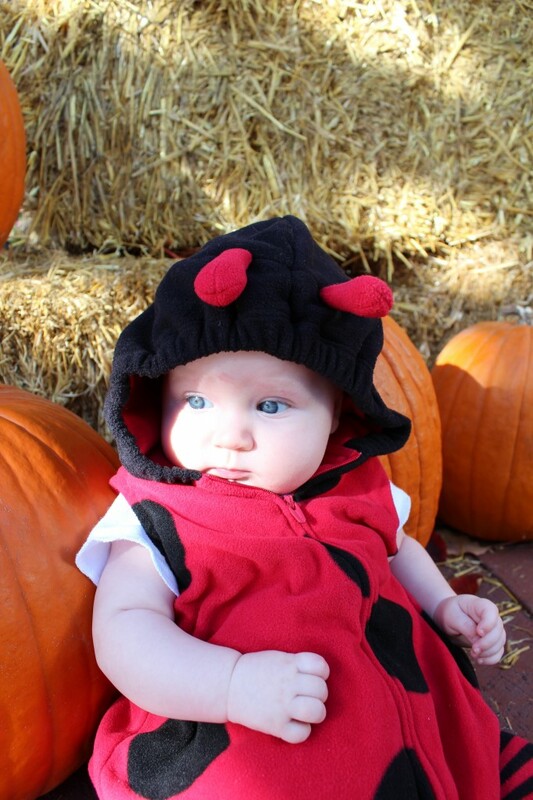 Today was Emmie’s first Halloween, and we definitely did it in style! Mimi came up to Boulder for our first visit since she got back from living in London for 9 months (cool!). 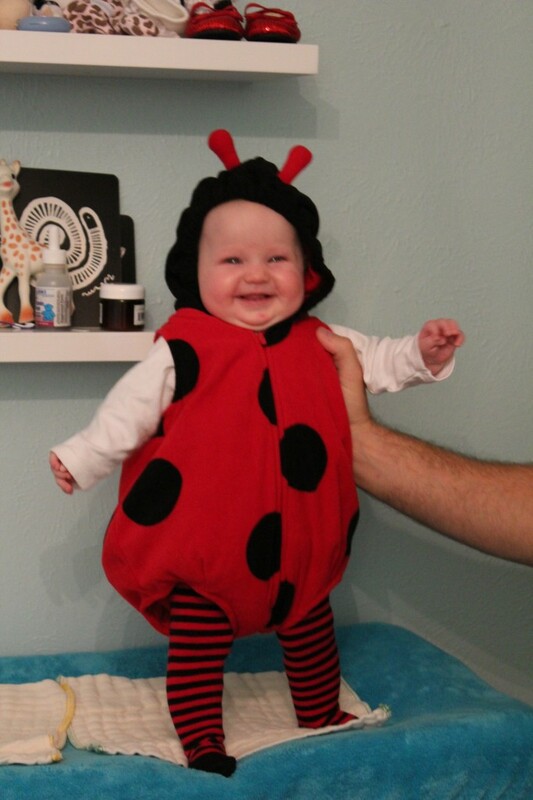 Look how far Mimi came to hold this little ladybug! 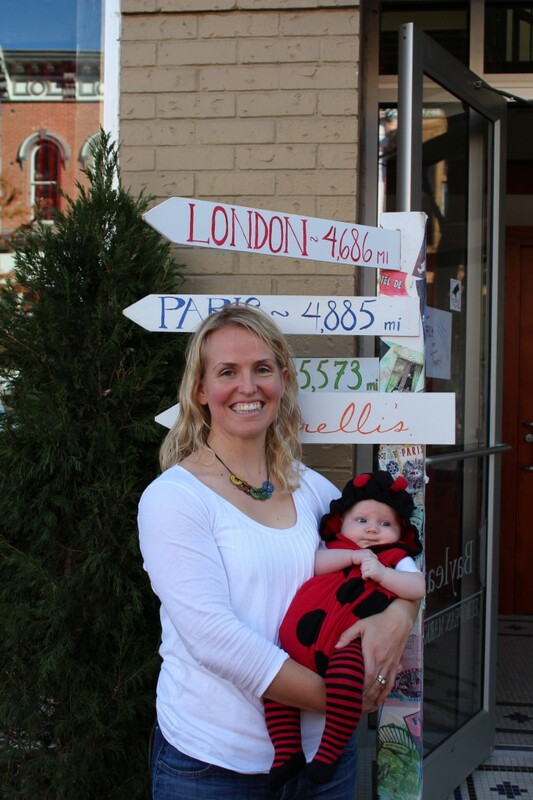 4,686 miles! We went to Pearl Street in Boulder for the “Munchkin Masquerade.” It was pretty much the cutest afternoon of my life. There were hundreds and hundreds of kids in all kinds of costumes–some clever, some creative, all extremely cute. The weather was absolutely perfect: 70s and sunny. Since Emmie wasn’t exactly in it for the candy (and since I had forgotten to eat lunch), we sat outside at the Cheesecake Factory, ate and watched the cuteness parade past. There was even a “photo op” with hay bales and pumpkins, which was perfect, since we didn’t exactly make it to the pumpkin patch this year. I’m working Saturdays now, which is awesome for reducing the childcare needed, but definitely cuts into the time we have for activities and outings as a family. So I snapped this one quickly, so at least we have a picture with pumpkins! In this picture, you can also kind of see the little hint of gold she’s getting in her right eye. It makes me wonder if she’ll end up with hazel eyes like her mama! 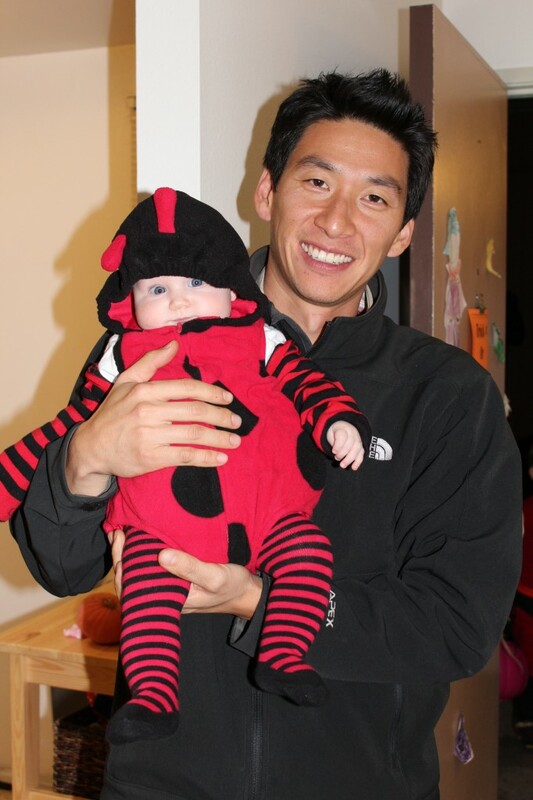 Even though I thought Emmie wouldn’t even make it through the afternoon on Pearl, she was doing AWESOME, so I picked up Peter and we went over to our dear friends, the Kim family, for some hard-core family housing trick or treating (since we get NO kids in our college-student complex). Emmie with Peter before he got into his ’70s Vegas-Jumpsuit Elvis costume. A picture of Dan and Emmie because I didn’t get a good picture of his adorable little girls as a banana and a ghost. Dan may be cute, but his girls are approximately 10,000 times cuter. Sorry, Dan. Emmie did really well until it was her bedtime, then she was NOT HAPPY that she was not at home, in her crib, swaddled and sleeping. Poor baby. I can’t blame her at all, but she was a champ and got through it and finally got to sleep once her silly mama got her fed, changed and swaddled. And Emmie didn’t even get any candy to show for it! 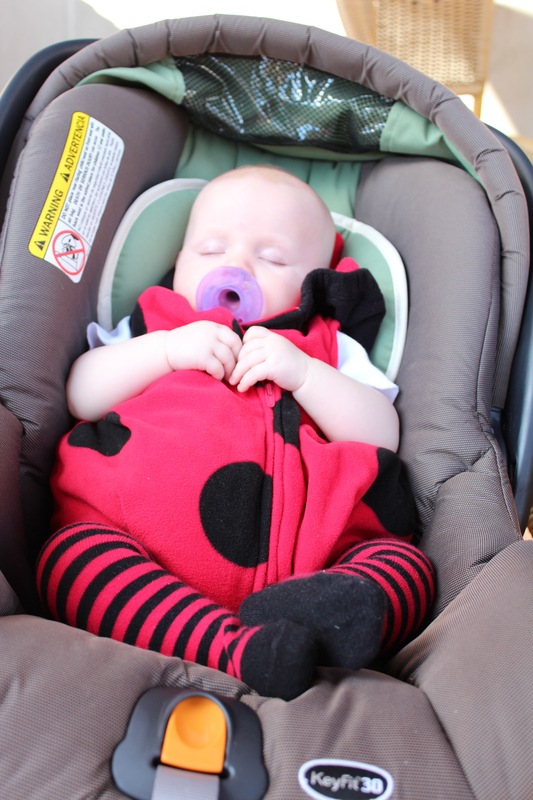 Ladybug,Ladybug fly away home…. 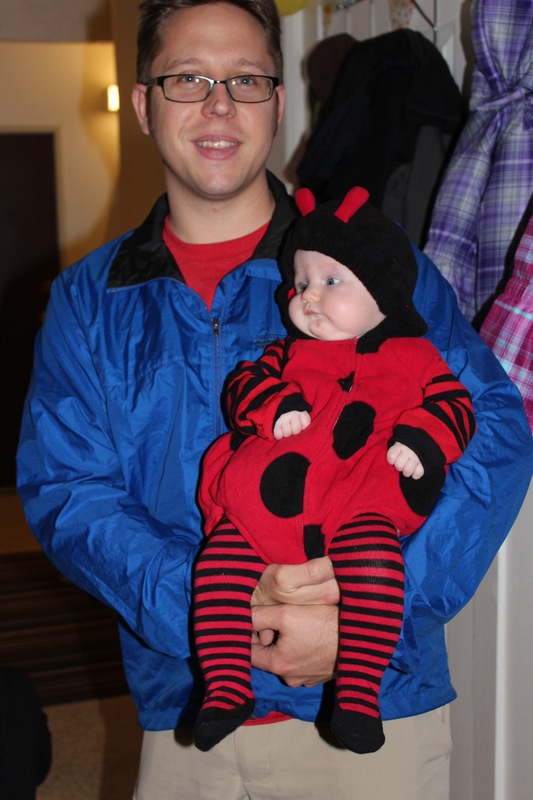 what a cute lady bug! I did the blog feed thing…but now I hope I can find out how to open the feed….or whatever. Head is spinning, time to go read more student papers.